This is a detailed list of the product features of Kore's Kourier Integrator REST solution for MultiValue applications. Please visit the Kourier Integrator detailed feature page for more information on that product and related products such as SQL Accelerator and other modules. Integrate and modernize your MultiValue applications. Provide real-time access (queries and updates) to UniData/UniVerse (U2) databases from anywhere (e.g., web pages, mobile applications, third-party applications, etc.) 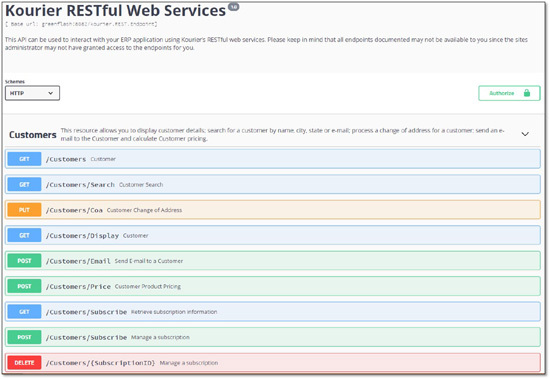 using RESTful Web Services APIs. Kourier REST also supports API Subscriptions (Webhooks) enabling real-time notification of changes to data in the source application. This advanced integration feature gives your API consumers (the service or application calling the API) the ability to subscribe to your published APIs. Once subscribed, API consumers automatically receive notifications when data changes in the source application as they occur in real-time (e.g., new Customer, Price update, etc.). The subscribing applicaton or service can then take the appropriate based upon the notification. REST Subscriptions are implemented via the Webhooks paradigm and replace less efficient periodic polling methods previously used. With only a single mouse click on the Get Specification button in a Kourier REST Resource definition, you can automatically generate your API documentation in ready-to-use, beautiful, interactive Swagger 2.0 format. Swagger is not only cool, it makes both API developers and API consumers more productive too. It's also the emerging standard for REST documentation because it is the world’s largest framework of API developer tools for the OpenAPI Specification. 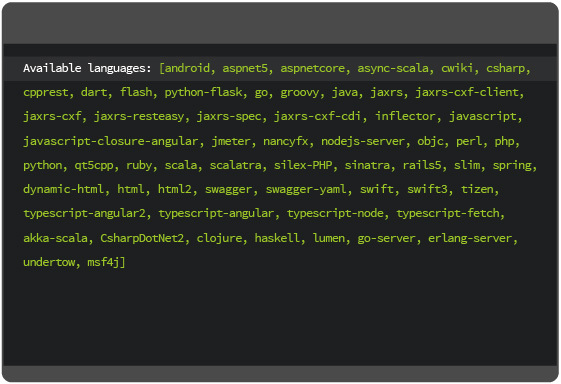 Create APIs in over 40 languages using Swagger!